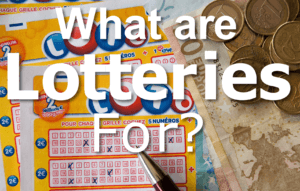 What is the Purpose of Lotteries? If you thought that lotteries were created for the sole purpose of awarding lucky individuals thousands or millions of dollars for nothing more than a couple of bucks, think again. Ever since the advent of lottery games, the main goal has always been to benefit the government. No—it’s not part of a sinister plot to pocket the public’s money right in front of everyone. Rather, lotteries were designed to help raise funds for government projects and other good causes. The best part is that—I’m sure you’ve figured it out by now—lotteries offer a mutually beneficial proposition. Governments can raise more than enough money to fund projects, without raising taxes, while players stand to win millions. It’s genius, really. Does it always serve its purpose though? No—not always. [h2 display=”The Trouble with Lottery Funds” menu=”On Lottery Funds”] Over the years, critics have been claiming that lotteries are actually doing more harm than good. If you think that such a proclamation is utter hogwash, the claims aren’t exactly baseless. Many people have noticed that instead of supplementing a state’s budget, it seems local governments have actually been using lottery revenue in lieu of their existing funds. North Carolina, for example, cut its education funding by 12% back in 2009. In 2015, records show that the state was funneling a smaller portion of its budget to education than it used to before their state launched their own lottery in 2005. Other states, like Florida and Michigan, were guilty of this as well at one point or another. Not everyone is guilty of this though—there are many cases where lotteries are able to fully serve their purpose. Iowa, for example, places money raised through the lottery in their state’s general funds. Colorado, on the other hand, uses the funds for environmental protection, while Montana uses it to aid schools and boost crime control efforts. Heck, even people in ancient times got it right. [h2 display=”Lottery Throughout History” menu=”Lottery Throughout History”] The earliest recorded instance of lottery being used to finance a major government project was during the Han Dynasty in China, somewhere between 205 and 187 BC. They used keno, a lottery-like gambling game, to help finance various projects at the time—like the construction of the Great of Wall of China, for one. Meanwhile, in Europe, during the reign of Roman Emperor Augustus Caesar, lottery tickets were sold to help fund repairs around the City of Rome. Citizens who won the lottery were awarded with articles of unequal value. It wasn’t until the 15th century that lottery prizes came in the form of actual money. The first recorded at the time was in the Low Countries of Europe, where various towns would hold public lotteries. The money raised through these games would then be used to build or repair town fortifications. Sometimes, it was to help the poor. [h2 display=”The Bottom Line” menu=”The Bottom Line”] These are but a small example of how, throughout its long history, lottery has been used as a tool to help fund government projects and to help the community. Sure, sometimes things don’t go according to plan—but, for the most part, lottery has been quite instrumental in many societal developments over the years. Something tells me it will continue to do so for a long time.